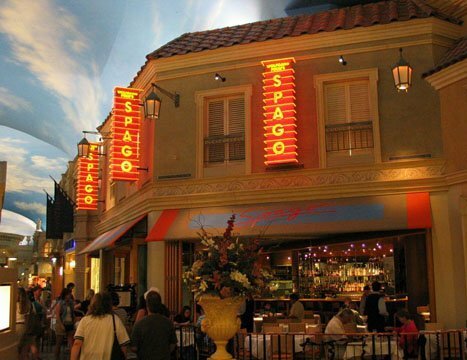 The first of the fine-dining imports to come to Las Vegas from across the nation, Wolfgang Puck's Spago, at the Caesars Palace forum shopping arcade, is still one of the best. Modern art adorns the multi-level, high-ceilinged space, where there's always a buzz. Though Wolfgang himself is known to pop in to man the stoves, his prot�g� and executive partner here, David Robins, and chef de cuisine Eduardo Perez, turn out reliable, sophisticated and daily changing fare in the Puck tradition. We're always happy with dishes such as Puck's signature smoked salmon pizza with dill cream, black caviar and chives; buttery-sweet foie gras; and Moroccan spiced yellowfin tuna with saffron couscous, sweet onion confit and carrot emulsion. Go for Wolfgang's take on a favorite comfort food, the meatloaf with red wine sauce and garlic mashed potatoes---among staples on the Caf� (adjoining the restaurant) menu, which also includes such seasonal specialties as chilled tomato gazpacho with shrimp ceviche and avocado cream. Master sommelier Luis DeSantos knows his way around the excellent wine list. Overlooking a bustling Forum Shops walkway, the Caf� is good for casual, no-reservations dining---and people-watching.